Tag line: "From the Vivid Pages of Charles Dickens' Masterpiece!" Based on Charles Dickens’ classic novel of the same name, David Lean's Great Expectations is a stunning tour-de-force, a film that is just about perfect. 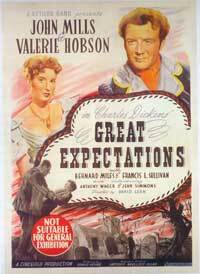 Great Expectations is the detailed account of the often tragic, sometimes wondrous life of a young man named Pip (played as an adult by John Mills, and as a boy by Anthony Wager). While out walking one evening, Pip comes across an escaped convict named Magwitch (Finlay Currie), who demands that the boy help him remove his shackles. Pip does as he’s told, and even though Magwitch is eventually re-captured, he greatly appreciates the kindness Pip has shown him. Soon after, Pip is invited to visit the crumbling estate of the elderly Miss Havisham (Martita Hunt), who, left bitter and heartbroken by a former lover, has raised her adopted daughter, Estella (played as an adult by Valerie Hobson and as a child by Jean Simmons), to be a seductress, a beauty with the power to capture the hearts of most men, none of whom she will truly love in return. Pip stays with the two of them for a time, then sets off to make his way in the world, at which point his life takes an amazing turn. Brought to London by the lawyer, Jaggers (Francis L. Sullivan), Pip learns that a wealthy benefactor, who wishes to remain anonymous, has agreed to be his sponsor, introducing the surprised young man to the world of high society. Yet, despite his good fortune, Pip cannot escape his past, nor forget the love he feels for the cold-hearted Estella. I admit I’m a fan of director Alfonso Cuaron’s 1998 version of this story, also titled Great Expectations, which starred Ethan Hawke as the protagonist (whose name has changed to Fin), Gwyneth Paltrow as Estella, and several other big-name actors, including Anne Bancroft and Robert DeNiro. Cuaron’s movie was a well-executed update of the story, but without a doubt, David Lean’s 1946 masterpiece is the definitive take on Dickens’s tale of romance and mystery. Though not nearly as epic in scope as many of his later works (Lawrence of Arabia, Dr. Zhivago), Lean's flair for spectacle is apparent even here, working within the confines of a studio. Everything about the look of this film, from the set decoration down to the period costumes, is incredible, and Lean’s camera sweeps over it all, drinking in everything this remarkable exposé of life in Victorian England has to offer. With the director’s eye for detail, aided at all times by the near-flawless performances of his cast, Great Expectations is great, indeed, and one of the finest motion pictures ever made. Just watched this in January and the whole family liked it. For a while my wife wasn't sure about it, she didn't like how cruel the girl was to Pip.